With revelatory street food and fresh interpretations at hip eateries, the Kyu empire has taken Asian fusion fast-cas to new heights. Calvin and Melody Truong sit at a black lacquered table inside Kyu Bochi, taking a short break at the Logan Avenue restaurant, the most recent addition to their family of Asian eateries that have become fast favourites with Winnipeg diners. This fourth property showcases flavours that are close to home for the couple, as Vietnamese, Thai, Laotian, Chinese and Cambodian influences are all part of their combined heritage. The rest of the Kyu empire includes the original Kyu Bistro, Kyu Slice, Kyu Grill and a mobile food cart that travels to events throughout the province. Culturally diverse Winnipeg has long offered an embarrassment of riches in terms of family-owned restaurants bringing food traditions and recipes from around the world. But the Truongs are part of a new generation of chefs and restaurateurs cutting their teeth in a unique culinary landscape. The definition of “high cuisine” itself is more diverse, and the cheffy food is becoming more readily available to the masses in the form of flavour-forward, ultra-hip fast casual restaurants that eschew table service but maintain quality at a welcoming price point. At each of the Kyu spots, boundaries are pushed and borders crossed, resulting in creations like bulgogi pizza, or a sandwich topped with the flavours of okonomiyaki. While restaurant life is hectic, Calvin is certainly no stranger to it. His parents owned the iconic Spring Roll Restaurant on Notre Dame Avenue when he was growing up, and by 22 he and Melody took over the restaurant. Three years later, and after plenty of travel and research, Calvin and Melody were ready for their own restaurant, an eatery specializing in ramen. “There was nothing in Winnipeg quite like it at that time,” he says. That little spot on Isabel, opened in 2013, became a launching pad thanks to a keen eye for business and the will to execute their vision perfectly. While food cities like New York and San Francisco were falling for ramen, Winnipeg didn’t yet have a spot that specialized in the Japanese noodle soup. The Truongs, along with their business partner Peter Truong, knew there would be a bit of learning curve, educating Winnipeggers about the joys of ramen—and its vast difference from the square packages of noodles that keep college students going. But it wasn’t long before a loyal following discovered Calvin’s flair for visual presentation and attention to the foundational details that make a dish spectacular. “It’s all about the broth,” says Calvin, adding that it took an entire year for him to craft the perfect recipe. The rich, flavourful result requires 17 hours of simmering. After fine-tuning the bistro’s offerings over a two-year period, Calvin—with his seemingly boundless energy—set his sights on sandwiches. Originally a mobile sandwich cart that now boasts space at The Forks Market, Kyu Grill introduced Winnipeg to playful signature sammies called heroshimas. The impressive subs are made with skewered, grilled meats tucked into sweet buns and garnished with Japanese-inspired sauces and toppings. Next came the acquisition of a former pizza restaurant on Pembina Highway that the pair operates with two business partners. Kyu Slice combines the couple’s love of Korean cuisine with a food almost universally beloved: pizza. When the opportunity arose to purchase an existing Thai restaurant last year, the Truongs jumped at the chance to get back to their roots. “Cambodian flavours are big and bold and we know that it might take some time for diners to get used to them,” Calvin said. “But we already have regulars who love the lok laf beef”—a spicy stir-fry—“and Cambodian chicken panang”—a type of thick red curry. 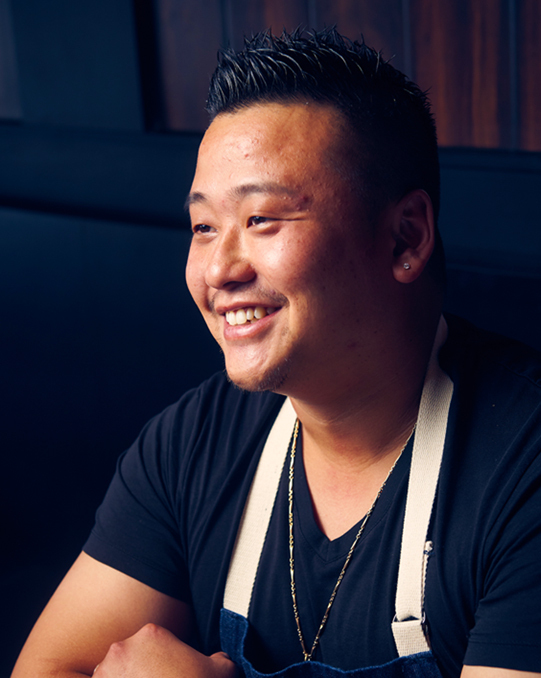 Calvin, who develops and meticulously fine-tunes the menu items at each location, is never without inspiration.